Boccioni was a member of the Futurists, a group of Italian artists who announced their existence in 1909 with a manifesto published on the front page of the French paper, Le Figaro. The group called for the abandonment of the past in favor of modern life and aimed to represent the metropolis in "multicolored and polyphonic tidal waves of revolution." 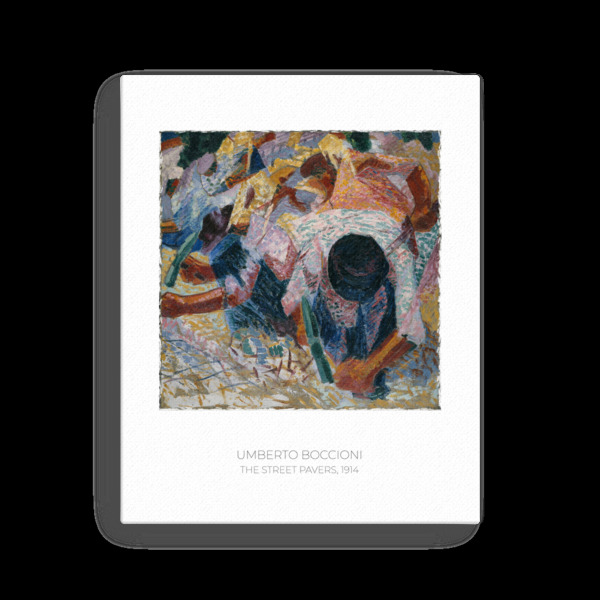 Canvases such as The Street Pavers offered Boccioni the opportunity to radically transform a scene of backbreaking work into a celebration of the powerful form of the modern laborer. Through his inventive use of pulsating color and rhythmic brushwork, the artist activated the surface of the canvas, making the faceless workers almost indistinguishable from their urban setting.